421-43084 Features: -Calcium stearate coating liquefies under heat keeping the material cooler and preventing loading with soft metals. -Premium blue fired AO grain with a polyester heat-treated backing. -Tool Shape: Type 27. -Arbor Diam: 7/8 in. 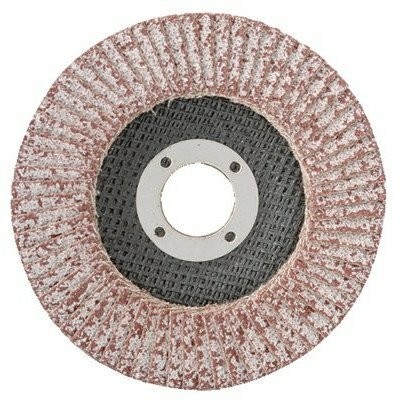 Product Type: -Coated Abrasives/Grinding Wheels. Dimensions: Overall Product Weight: -4.4 Pounds. Aluminium, Premium Blue fired AO grain with a polyester heat treated backing. Use on soft metals and blending stainless steel. A3 Material with Calcium Stearate coating liquefies under heat keeping the material cooler and preventing loading with soft materials. If you have any questions about this product by CGW Abrasives, contact us by completing and submitting the form below. If you are looking for a specif part number, please include it with your message.